If your brand is struggling in a crowded marketplace, there are a few time-tested marketing techniques that will always help it stand out. First, make the largest word on the package the name of a different product. Second, create a label that uses the colors and icons associated with that rival product. Third, use the name to suggest that the customer is a wide-eyed country dolt who will shout his wonderment to God and fellow shoppers when he discovers that he has been momentarily hoodwinked into thinking an imitation product is the real thing. In the years since the elder brand I Can’t Believe It’s Not Butter! pioneered this strategy to sell a spread with a tenuous health advantage over the dairy product it pretends to be, a huge number of oily substitutes have sprung up around it, each of them aghast at their own existence. Over at Boing Boing, Mark Frauenfelder has taken the time to insult every one of these thirsty margarines in turn, and it is no worse than they deserve. It’s incredible what you can achieve when you set your mind on imitating an imitation. 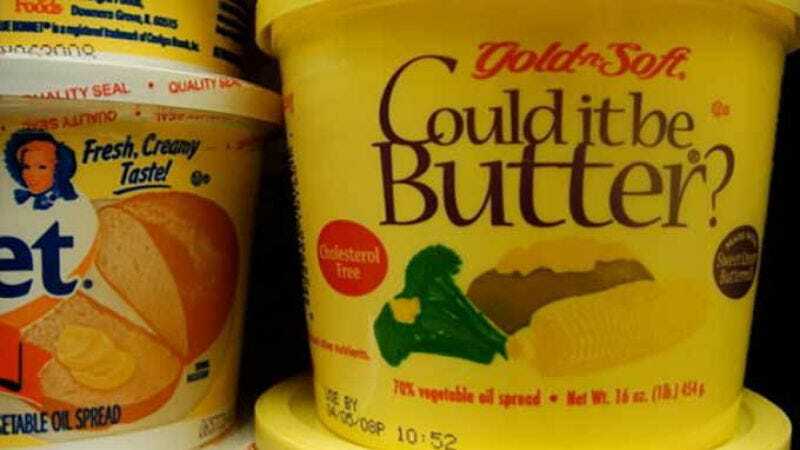 There’s even one counterfeit not-butter in the gallery Frauenfelder draws from: “Schrödinger’s Butter,” a photoshop from an ancient Something Awful post that seems to have gotten mixed in during the internet’s decade-long effort to catalog the world’s fakest butters.